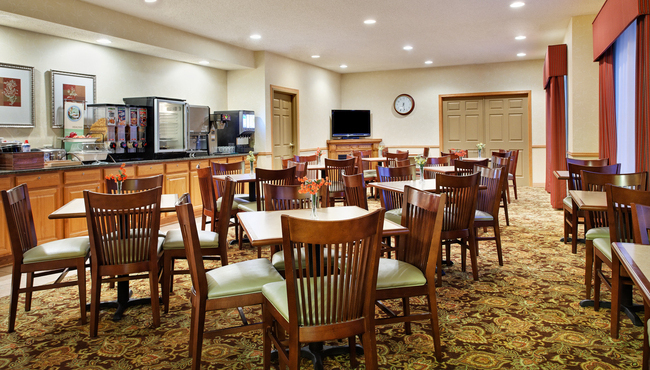 Pull your chair up to a plateful of Belgian waffles topped with syrup at the complimentary, hot breakfast served daily at the Country Inn & Suites hotel in Rock Falls, IL. Our morning spread also includes sausage, eggs, fresh fruit and yogurt. Later in the day, head to one of several nearby restaurants, or order room service from the Candlelight Inn Restaurant if you prefer to dine in the privacy of your room. Candlelight Inn offers room service every day from 11:00 a.m. to 10:00 p.m. Menus are available in each hotel room.